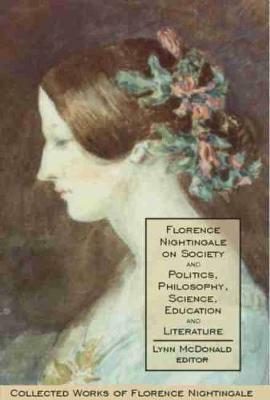 Florence Nightingale on Society and Politics, Philosophy, Science, Education and Literature , Volume 5 in the Collected Works of Florence Nightingale , is the main source of Nightingale's work on the methodology of social science and her views on social reform. Here we see how she took her "call to service" into practice: by first learning how the laws of God's world operate, one can then determine how to intervene for good. There is material on medical statistics, the census, pauperism and Poor Law reform, the need for income security measures and better housing, on crime, gender and the family. Her comments on a new edition of The Dialogues of Plato are given, with their impact on the revision of the next edition. We see Nightingale's condemnation of Plato's "community of wives," with her stirring approval of love (even outside marriage! ), marriage and the family. In this volume also her views on natural science, education and literature are reported. Nightingale was an astute behind-the-scenes political activist. Society and Politics publishes (much of it for the first time) her correspondence with such leading political figures as Queen Victoria, W.E. Gladstone and J.S. Mill. There are notes and essays on public administration and personal observations on various members of royalty, prime ministers and ministers, and Indian viceroys. Nightingale's support of the vote for women (contrary to much in the secondary literature) is here shown. Correspondence and notes on British general elections from 1834 to 1900 is reported, with letters to and for (Liberal) political candidates and fierce condemnations of Conservatives. Currently, Volumes 1 to 11 are available in e-book version by subscription or from university and college libraries through the following vendors: Canadian Electronic Library, Ebrary, MyiLibrary, and Netlibrary. Lynn McDonald , director of the Collected Works of Florence Nightingale , is university professor emerita at the University of Guelph. She is an environmentalist, a former member of parliament, a former president of the National Action Committee on the Status of Women, and a long-time activist on womens issues. She has an honorary doctorate from York University.